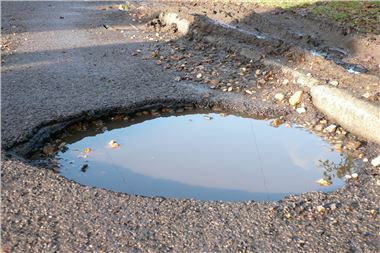 Motorists are being warned to brace themselves for the "worst ever pothole season", say experts. Road maintenance campaign website, Potholes.co.uk, has already seen a 100% increase in web traffic during last week's nationwide blanketing of snow, with twice as many visitors as the same week in 2009. Mechanical insurance provider, Warranty Direct, which runs Potholes.co.uk, expects to see a sharp increase in claims for axle and suspension related damage in the coming weeks. Last year, it estimated that British motorists paid out £320m in repairs to everything from wheels and tyres to suspension failure. "That figure could pail into insignificance," warns Duncan McClure Fisher of Warranty Direct. Potholes are caused by water or snow filling existing cracks in road surfaces and freezing. The expansion this causes breaks open the road, which is revealed when the ice melts. Potholes are particularly prevalent in and around speed humps and speed cushions because the constant impacts of vehicles passing over them causes cracks in the road surface. Repeated freeze-thaw cycles cause maximum damage. McClure Fisher added: "The roads are going to deteriorate incredibly quickly over the coming months. Given the severity and earlier than normal arrival of harsh wintry conditions, everything is pointing towards a miserable period for motorists." Spending cuts will also impact the issue. "Local councils and Central Government have a duty of care to maintain the roads of Britain. Yet, with the extended period of cold weather and councils trimming budgets across the country, it's hard to see how they will be able to tackle what points towards being the worst ever pothole season." Anyone can report a road defect using Potholes.co.uk, and Fixmystreet.co.uk which have contact details for councils across England, Scotland and Wales. It is important to do this because it then becomes a matter of record and if the council does not repair the pothole it will be liable for any damage the pothole causes to vehicles.